Nuclear activist, writer and poet Kathy Jetñil-Kijner from the Marshall Islands has launched her new poetry work which has a focus on nuclear weapons. Her newest poem, “Anointed” can be seen as a short film by Dan Lin on YouTube. By Dr Sylvia C. Frain At da Shop bookstore for the official launch of her poem, Jetñil-Kijner shared her writing process inspiration with the gathered audience. “I knew this poem could not be a broad nuclear weapons poem, but I needed to narrow the focus,” says Jetñil-Kijner. The project, which has an aim to personalise the ban of nuclear weapons, began during a talk-story session with photojournalist Lin three years ago in a café. Jetñil-Kijner told Lin that she wanted to perform a poem on the radioactive dome located on what remains of the Runit Island in the Enewetak Atoll Chain. Lin, who before this project worked as “only a photojournalist,” agreed to document this collaborative “experiment”. Lin spoke of how Jetñil-Kijner’s previous poems had the “Kathy effect” which were filmed with only an iPhone and went viral across digital platforms. However, they agreed that this story deserved more in-depth documentation. They partnered with the non-profit organisation, Pacific Resources for Education and Learning (PREL) and with the Okeanos Foundation, specialising in sustainable sea transport. Travelling by Vaka Motu and Ocean Canoe for 11 days, Okeanos Marshall Islands ensured that zero carbon emissions were used and the experience served as a way to connect with the sea. The radioactive dome on Runit Island is one of 14 islands in the Enewetak Atoll Chain, and the farthest atoll in the Ralik chain of the Marshall Islands. 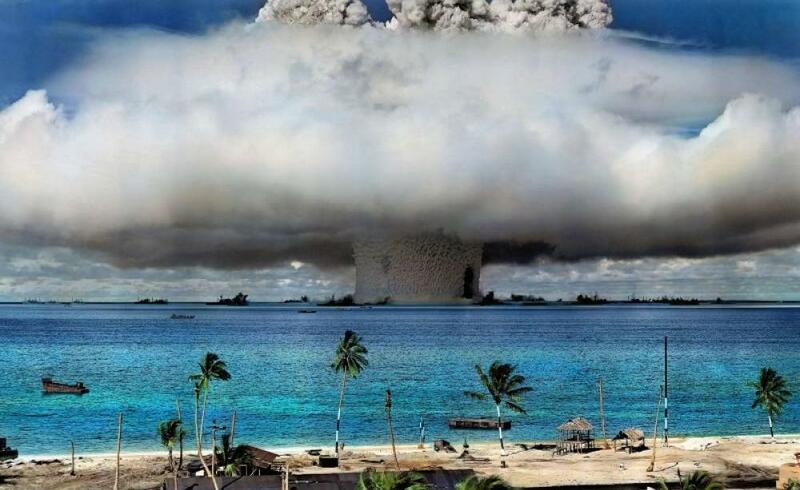 Enewetak and surrounding area has been studied scientifically after the 43 nuclear bomb explosions (out of the 67 total nuclear tests in the Marshall Islands) by the United States between 1948-1958. Dubbed the “Cactus Crater”, Runit Island has limited economic possibilities. It is not a tourist destination nor has ability to export goods. No one will visit or purchase products from a radioactive location. This leaves the community dependent on funding from the United States. While many are grateful, they truly want to self-sustaining future. While conducting research for the poem, Jetñil-Kijner found that most of the literature is scientific and by journalists or researchers who do not include the voices of the local community or share the end results. Jetñil-Kijner wanted to create a poem focusing on the story of place beyond the association as a bombing site, and ask, “what is the island’s story?” She learned from the elders that the island was considered the “pantry of the chiefs with lush vegetation, watermelons, and strong trees to build canoes”. As one of the remote atolls, the community consisted of navigators and canoe-builders with a thriving canoe culture. Both Lin and Jetñil-Kijner said visiting the atolls was emotional and that approaching the dome felt like “visiting a sick relative you never met”. The voyage included community discussions with elders and a writing workshop with the youth. Since the story of the dome is not usually a “happy one” the gatherings and workshops served as a method for the people to tell their stories not covered in the media or reported in US government documents. Creating the poem with the community also required different protocols and Jetñil-Kijner thanked the community for generously sharing their knowledge and stories. She spoke to how the video connects the local community with a global audience across digital platforms.